A city in New Mexico has transformed its GIS into an enterprise implementation in a relatively short time, aided by enterprise licensing. Located just north of Albuquerque, Rio Rancho has a population of 92,000. Like many other cities, Rio Rancho's GIS had developed in departmental silos, with Public Works and Development Services leading the way. After a decade of uncoordinated use, the city understood that GIS was becoming more instrumental to service delivery. Therefore, the city embarked on a strategic planning process with the goal of advancing and coordinating GIS enterprise-wide. Late in 2012, the city promoted John Martineau to the role of GIS manager. At the outset, Martineau determined that he wouldn't be satisfied unless the GIS was doing everything that it could to advance service delivery in every department. He understood that GIS was not a stand-alone technology. His goal was to have GIS become the portal into all city data—spatial and nonspatial. The city partnered with Esri Gold Tier Partner Geographic Technologies Group (GTG) to achieve this goal. Early in the project, it became apparent that the city's software needs had outstripped its licensing. Users were being educated about GIS, and the demand for access to GIS data and software was increasing rapidly. Concurrently, the GIS team was investigating ArcGIS for Local Government and ArcGIS Online as a means of disseminating information and functionality to the organization and the public. An analysis of the financial commitment necessary to deliver the planned solutions prompted the city to enter into an enterprise license agreement (ELA) with Esri. Once the GIS team was no longer constricted by lack of software licensing, the expansion of GIS began in earnest. Martineau insisted that enabling users with traditional GIS data was insufficient. His vision was to use GIS as the window into all of the city's technologies and data. To that end, the city's GIS team worked with GTG to geoenable every dataset imaginable. Existing IT datasets were scrubbed and geoenabled. This included data from SunGard HTE (for licensing, permitting, utility accounts, 911, and police records), MicroPaver (for pavement management), Maintenance Connections (for work orders), RescueBridge (for fire records), and GraniteXP (for pipeline inspections). In addition, the city's 1,800 scanned documents—engineering drawings, studies, reports, project files, and plans—were linked to their geographic location. Back end middleware was deployed to synchronize these systems continually so that data is immediately available within the GIS. All this data, coupled with more than 100 GIS layers, provides a wealth of information. Existing data was ported into the Esri Local Government Information Model (LGIM) so Esri maps and apps could be leveraged. The challenge was how best to enable users to consume and analyze all of this information. The city recognized that application deployment is where many organizations fail to realize the true power of GIS. After much planning, the city decided to implement a diverse collection of ArcGIS Online, ArcGIS, and third-party Esri-based apps. These apps were selected to meet the needs of three groups: internal users, city workers in the field, and the public. Internally, a mix of applications was chosen. 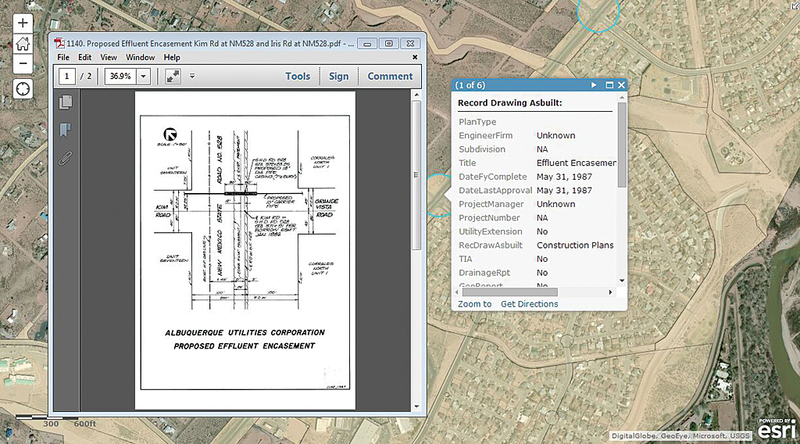 ArcGIS Viewer for Flex was deployed through eight targeted portals instead of deploying a single one-size-fits-all app that would not be the right fit for all Rio Rancho users. These portals were configured to meet the specific needs of user groups by configuring MapTips, data layers, and searches and linking to non-spatial IT systems. Portals were deployed for the city clerk, city manager, code enforcement, development services, financial services, parks and recreation, public works, engineering, and public works utilities. This meant that departments no longer needed to consult various datasets to access the information needed. The result: decision making has been streamlined, time is being saved, and city staff members are more informed. 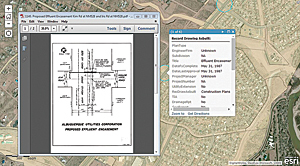 ArcGIS Online Field Viewer for Line Locators lets field-workers view the location of as-builts throughout the city and retrieve PDFs for specific as-builts. City of Rio Rancho staff members indicated they not only needed to have access to pertinent GIS data layers in the office but also access to this information in the field. This need was met by deploying mobile GIS maps to field crews. The city decided to use ArcGIS Online maps and applications to make this data available in the field. Staff members no longer print hard-copy maps or have to remember information they viewed in the office. Now they can access that data in the field. The city deployed four mobile maps as part of this initiative. The mobile map for building inspectors contains two vital layers of GIS data for inspectors—parcel data and building permits. The engineering mobile application allows the engineering staff to view parcel data as well as record as-built drawings. Not only can staff view the area for each as-built, but they can bring up a PDF of the as-built while in the field to get more information. The third application is for line locating crews. This application, similar to the application for engineering staff, allows staff to view the location of as-builts throughout the city and to retrieve the PDF of that particular as-built. 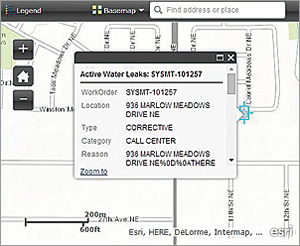 The fourth mobile application allows utility staff to view information from the computerized maintenance management system (CMMS) as well as sewer, water, and stormwater gravity main data. Public safety had needed to use specialized third-party products. GTG's Looking Glass Suite was selected for use in the 911 center, and police and fire departments. The 911 center had struggled for years with software that could not use live data with Esri GIS software. Looking Glass Dispatch enabled dispatchers to track all active incidents, link building preplans and CCTV feeds, view live traffic data, and access any GIS data layer. The fire and police departments were enabled with Vantage Points Public Safety Analyst (PSA). PSA allows staff to view all incidents, do hot spot analysis and predictive analysis, and access executive dashboards that display live data. Public safety wanted to use GIS in the field. To that end, the department deployed Vantage Points Mobile for their mobile data terminals (MDTs) and Vantage Points SMART for use on tablets and smartphones. Field staff can now view live GIS data, incident data, and the geolocation of vehicles and smart devices. It was important for the city of Rio Rancho to provide GIS data and information to citizens through an easy-to-use GIS portal. The city deployed three GIS portals for citizens' use: one showing water leaks, another for viewing parcel information, and a parks and recreation area locator. Each app was built using the ArcGIS Online apps the city could access with its ArcGIS Online organizational subscription. The water leak map lets citizens view the location and other information about water leaks in the city. This data is derived directly from the water database using SQL statements. With the parcel map, citizens can view information about real property located in the city. Finally, citizens can use the parks and recreation finder to search for parks and amenities near their address, find out about city parks, and get routing information to parks. The goal of most municipal GIS implementations is enterprise-wide adoption. Rio Rancho has achieved enterprise-wide success in a short time by focusing on user needs, identifying practical solutions, and leveraging the power of the Esri toolset. Plans are under way to continue expanding Rio Rancho's hugely successful effort with dataset development and implementing a number of other internal and external portals. For more information, contact Curtis Hinton, president of GTG, at 919-344-2169, or John Martineau, GIS manager for the City of Rio Rancho, New Mexico, at 505-891-5054.